This chapter presents the results of a study aiming at restricting the flow of information exchanged between various agents in a coalition. More precisely, when an agent expresses a need of information, we suggest sending only the information that is the most useful for this particular agent to act. 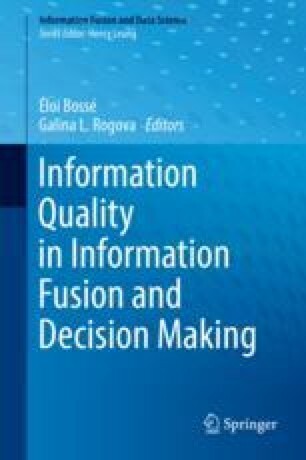 This requires the characterization of “the most useful information.” The model described in this chapter defines a degree of usefulness of a piece of information as an aggregation of several usefulness degrees, each of them representing a particular point of view of what useful information might be. Specifically, the degree of usefulness of a piece of information is a multifaceted notion which takes into account the fact that it represents potential interest for the user with respect to his request, has the required security clearance level, can be accessed in time and understood by the user, and can be trusted by the user at a given level. This study was granted by DGA (Direction Générale de l’Armement) in the context of a Specific Agreement between France and Canada (AS 32). Reliability of the source is designated by a letter between A and F as defined below. A source is evaluated A if it is completely reliable. It refers to a tried and trusted source which can be depended upon with confidence. A source is evaluated B if it is usually reliable. It refers to a source which has been successfully used in the past, but for which there is still some element of doubt in particular cases. A source is evaluated C if it is fairly reliable. It refers to a source which has occasionally been used in the past and upon which some degree of confidence can be based. A source is evaluated D if it is not usually reliable. It refers to a source which has been used in the past but has proved more often than not unreliable. A source is evaluated E if it is unreliable. It refers to a source which has been used in the past and has proved unworthy of any confidence. A source is evaluated F if its reliability cannot be judged. It refers to a source which has not been used in the past. Credibility of information is designated by a number between 1 and 6 signifying varying degrees of confidence as indicated below. If it can be stated with certainty that the reported information originates from another source than the already existing information on the same subject, then it is classified as “confirmed by other sources” and rated 1. If the independence of the source of any item of information cannot be guaranteed, but, if, from the quantity and quality of previous reports, its likelihood is nevertheless regarded as sufficiently established, then the information should be classified as “probably true” and given a rating of 2. If despite there being insufficient confirmation to establish any higher degree of likelihood, a freshly reported item of information does not conflict with the previously reported behavior pattern of the target, the item may be classified as “possibly true” and given a rating of 3. An item of information which tends to conflict with the previously reported or established behavior pattern of an intelligence target should be classified as “doubtful” and given a rating of 4. An item of information which positively contradicts previously reported information or conflicts with the established behavior pattern of an intelligence target in a marked degree should be classified as “improbable” and given a rating of 5. An item of information is given a rating of 6 if its truth cannot be judged.